Now that you’re done with the holidays, it’s time to get on track. 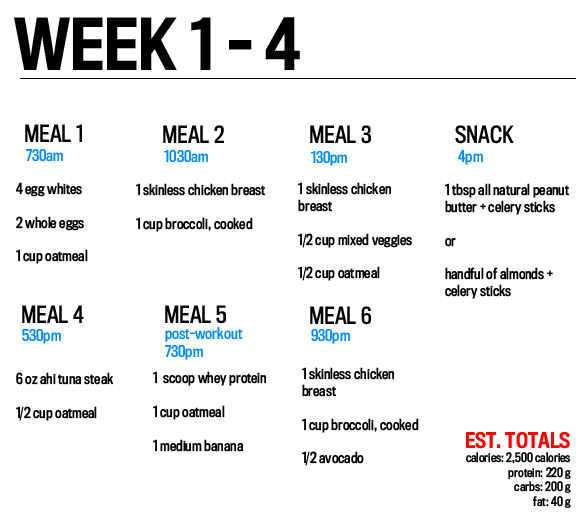 Jumping right into it, in weeks 1-4 you’re going to use all the extra calories you’ve consumed to build some muscle. Coming into this program in a calorie surplus will serve as an advantage as the first weeks of the program focus on strength- and mass-building. Believe it or not, you will still consume a decent amount of carbohydrates to recover from the day-to-day assault on your body, especially from Monday through Thursday, which are both heavily loaded, lower-body days. 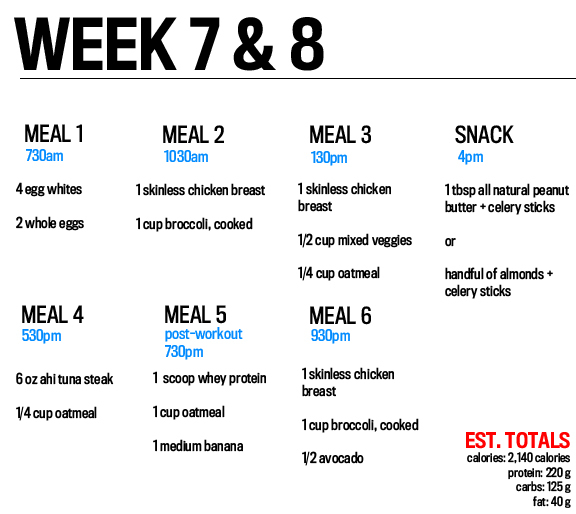 Below is a sample diet; you’ll eat approximately 2,500-2,800 calories if you have a 170-180lb target. Transitioning into Weeks 5 and 6 you should carry a few more pounds of solid mass, and it’s time to begin the process of stripping the fat off to reveal all the hard work you’ve done over the past month. 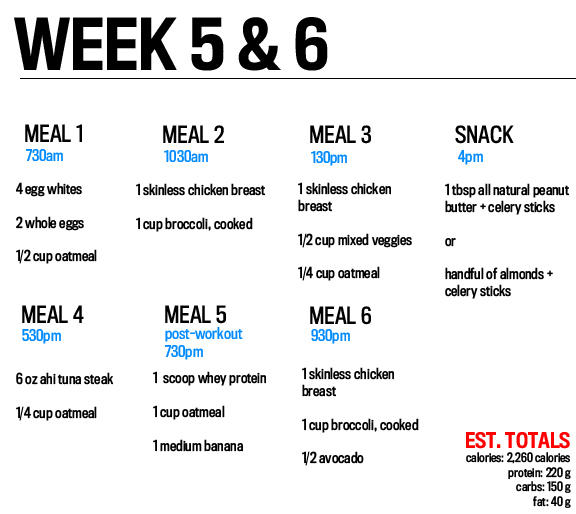 The most important thing about Weeks 5 and 6 is that you’re just beginning the fat-loss process. So while you’ll cut back on the carbs, it’s not a switch to a carb-free diet; you’ll still need those carbs for recovery. Essentially, this period is where you’ll increase caloric expendature and reduce your consumption—slowly. Don’t be surprised if you notice a slight decrease in strength; this can be expected when moving into more of a fat-loss and conditioning program vs. a strength- and mass-building plan. Below is a sample diet. You’ll eat approximately 2,250-2,500 calories. Finally, working into Weeks 7 and 8 you’re in full-blown fat-burn mode. Your total calorie intake will drop along with your carbohydrates. However, your fat intake will remain elevated to stabilize hormone levels and make up for the reduction in total calories and carbs. Your strength may decrease, but, again, this is an extreme fat-loss portion of the program. Workouts will be challenging and tiresome, but worth the reward in the end. Make it through these last two weeks of workouts and it’s back to the mass-building from Week 1. Here is a sample diet; you’ll eat approximately 2,000 calories.